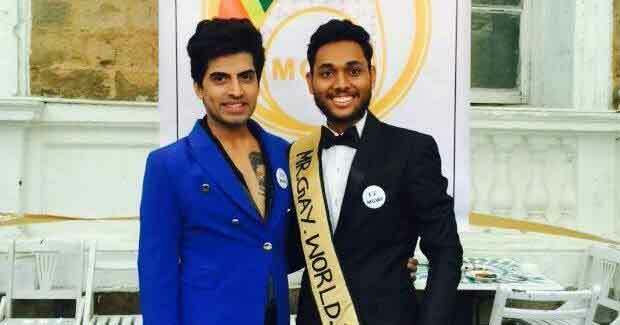 Odisha boy Anwesh Sahoo won the Gay World India (MGWI) title in Mumbai on January 25 and now he will represent India at the Gay World to be held in Malta (Europe) from April 9 to 23, this year. Hailing from Kaniha in Odisha’s Angul district, Anwesh was a victim of bullying during his school days. Today, the story is completely different. A student of International Institute of Information Technology in New Delhi, this 20-year old scored over 232 participants to clinch the Mr. Gay World India (MGWI) title in Mumbai on 25 January. Anwesh Sahoo will be mentored by Sushant Divgikar, national director of MGWI and a team. Divgikar has represented India at the pageant in 2014 in Rome. Divgikar says, “At 20, Anwesh is the youngest MGWI. He was the dark horse in the preliminary rounds of the pageant. But he was consistent, beating 232 others. He is talented and has a great future. I will have people from the glamour industry to groom Anwesh and teach him etiquette. Former beauty pageant winners and models will train him, in different aspects like diction, walking gait, how his skin and body can look great,” said Divgikar. Inspired by the Andreas Derleth, the 2012 winner of Mr. Gay World, Anwesh chose to reveal his homosexuality and gather courage to openly be who he is. This also helped him in the social skills round of MGWI that has the theme, campaign with a cause. “I chose ‘fitting out’ which is opposed to fitting in as the theme for my campaign cause. Masculinity and femininity are being redefined. People need to be empowered for who they are. I drew inspiration for this campaign from my struggle to be accepted in school,” said Anwesh to the media. Anwesh Sahoo is well-aware of the brickbats about to come his way. But he is focusing on winning the pageant and is fuelled by the idea that he is inspiring many like him to break the shackles of stereotypes and come in terms with who they are.